Well, I can’t keep this to myself… so the cat is out of the bag a bit. I can’t wait to share more details with you when I can! Yvonne! Fantastic! Well deserved! QuiltCon! And absolutely gorgeous! What a great transparency spin! Huzzah!! Congratulations! What excitement! I have spent some time gazing at both covers. I really really really wish they had done the layout on the cover with your quilt better. I guess it has something to do with how large the quilt is on the cover and needing to show the edge of the design, but they left themselves very little room for the text they wanted to incorporate. So, that’s on them and not you, but it bothers me. I think they could have staged both quilts better, too. Is it weird that I want to vote for your quilt cover just because it has that “Make This Quilt” button? LOL. Congrats again! I am so happy for you! PS – The photo really brings out the amazing quilting on your quilt! That’s so awesome, Yvonne! 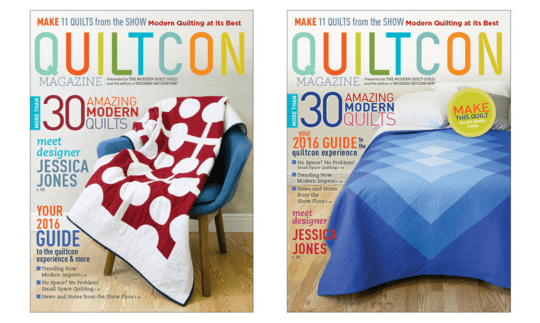 When I saw the e-mail from MQG, there was something about that Cover Girl blue quilt that seemed terribly familiar. This means you’re officially blog famous – when people can recognize your work even when it’s not on your blog! Way to go! Yvonne, Congratulations! I literally am jumping up and down clapping for you! I am so thrilled for you and you deserve this honor and of course the COVER! YIPPEE! I definitely went and voted for you and your magnificent quilt! Oh my goodness, what exactly are you feeling? Is this your first cover quilt? How many quilt patterns have you had published in magazines or books? Another question….Does the magazine come and ask you or do you have to send in photos and a form? I really do hope that you win! Please keep us informed! Which by the way…when will you find out and when will it be published? This will be one magazine issue I will be buying! Congratulations once again! I voted the moment I got it in my mail. Congrats and good luck! Yay! Love this! Thanks for the shoutout! I wrote a post too 😀 I’m super inspired by you. xo. So excited for you! I love how your quilt looks in that photo too! Stunning!!! Love the scale and shades of blue. But yours truly is the most beautiful. I voted for you. Oh my goodness, this is awesome! Congrats on being in the running for a spot on the cover! I’m super excited to just see it on the cover for voting! I do wish their styling of both quilts had been better, and that the text layout was better on yours. But over all your quilt got the better photo, and I think it compliments the text colors better than the red and white one. I tried to vote for your cover quilt but it took me to Facebook. I don’t have/use Facebook. If there’s another way to vote, please tell me and I’ll do so. Thanks. You are kidding?!! That is so fantastic Yvonne!! Congrats and what a way to make a huge splash in the MQG!! Congratulations! What a wonderful surprise! Of course I voted for yours. Looking forward to seeing more of it when you can share. I was so excited for you when I got the email! I’ve voted, good luck! I don’t have to be a MQG member to vote? Cool! I do love this quilt, it really is beautiful in the blue. Have you heard yet what the outcome is?